Requirements were REVISED effective January 1, 2018. Understand how coins are made, and where the active U.S. Mint facilities are located. Explain the grading terms Uncirculated, Extremely Fine, Very Fine, Fine, Very Good, Good, and Poor. Show five different grade examples of the same coin type. Explain the term proof and why it is not a grade. Tell what encapsulated coins are. Know three different ways to store a collection, and describe the benefits, drawbacks, and expense of each method. Pick one to use when completing requirements. Demonstrate to your counselor that you know how to use two U.S. or world coin reference catalogs. Read a numismatic magazine or newspaper and tell your counselor about what you learned. Describe the 1999–2008 50 State Quarters® program or the America the Beautiful Quarters® program. Collect and show your counselor five different quarters from circulation you have acquired from one of these programs. Collect from circulation a set of currently circulating U.S. coins. Include one coin of each denomination (cent, nickel, dime, quarter, half-dollar, dollar). For each coin, locate the mint marks, if any, and the designer’s initials, if any. Identify the people depicted on the following denominations of current U.S. paper money: $1, $2, $5, $10, $20, $50, and $100. Describe the role the Federal Reserve System plays in the distribution of currency. Collect and identify 50 foreign coins from at least 10 different countries. Collect and identify 20 bank notes from at least five different countries. Collect and identify 15 different tokens or medals. Tour a U.S. Mint facility, the Bureau of Engraving and Printing facility, a Federal Reserve bank, or a numismatic museum or exhibit, and describe what you learned to your counselor. With your parent’s permission, attend a coin show or coin club meeting, or view the website of the U.S. Mint or a coin dealer, and report what you learned. 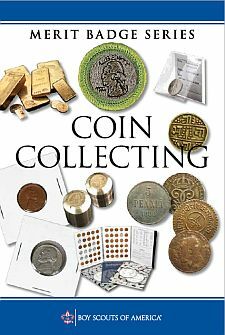 Give a talk about coin collecting to a group such as your troop, a Cub Scout pack, or your class at school. Do drawings of five Colonial-era U.S. coins.